The promise of a warm Spring day in Kansas City can often change quickly. Such was the case when we visited the National Agricultural Center and Hall of Fame in Bonner Springs, Kansas. We were meeting up with a group of social influencers who had been invited to an Instameet being hosted by Visit Kansas City, Kansas. By the time we arrived, a blustery wind had brought in clouds, cooler temperatures, and the threat of rain. At least the first portion would be indoors. 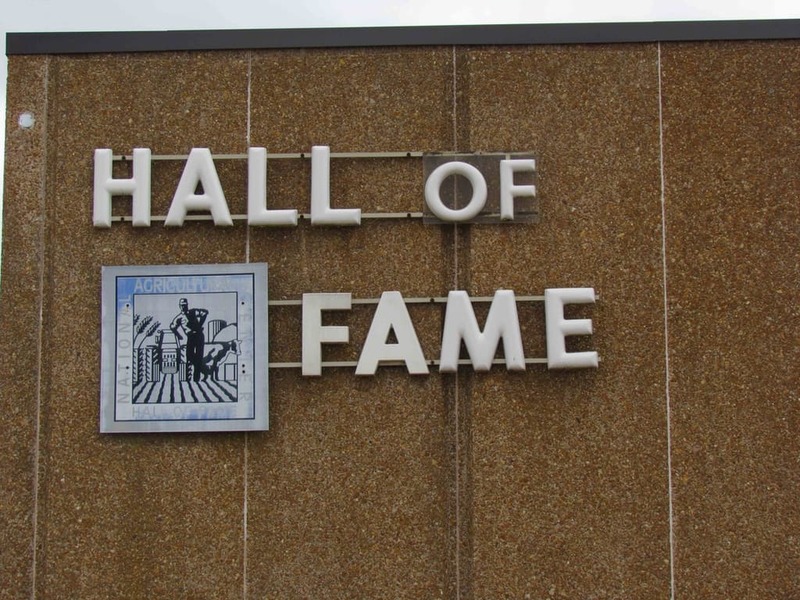 We want to thank the Ag Hall of Fame and Visit KCK for their hospitality. Rest assured that all opinions are our own. 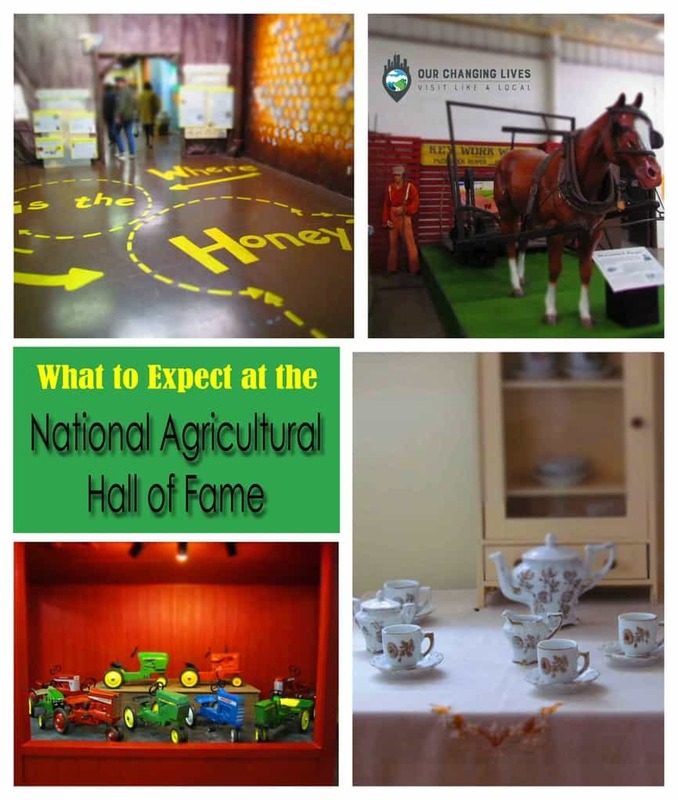 The Ag Hall is designed to showcase the role that agriculture has played in the foundation of this country. The museum is set up to have something to interest all ages. 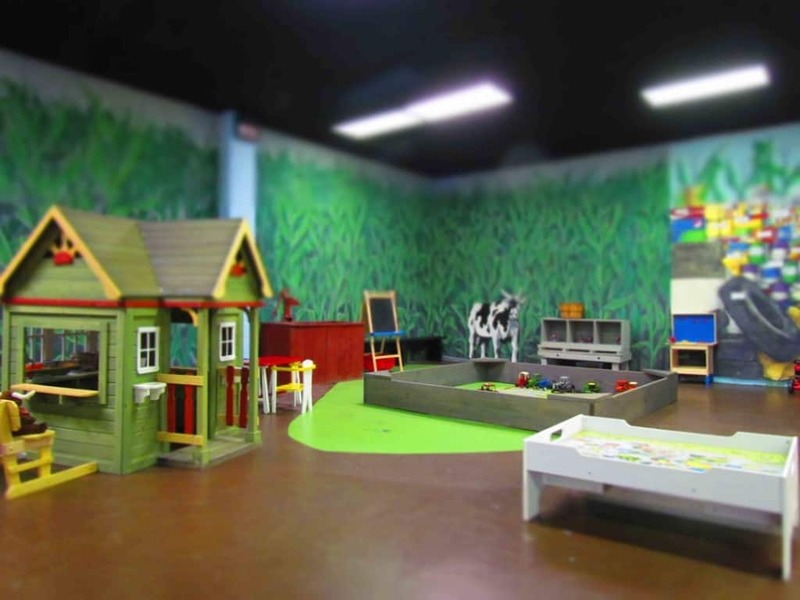 As we entered the Gallery, the first exhibit we found was a children’s play area. It has a lot of things to hold the interest of school age and younger kids. With none in the area at this hour of the morning, we could only imagine the shrieks and squeals that would accompany the activity. Moving into the next area, we entered a series of rooms designed to shed light on our declining population of honey bees. We are sure most of you are aware of this disturbing pattern, and the Ag Hall does a good job at explaining the important role that these pint-sized pollinators play in the food chain. 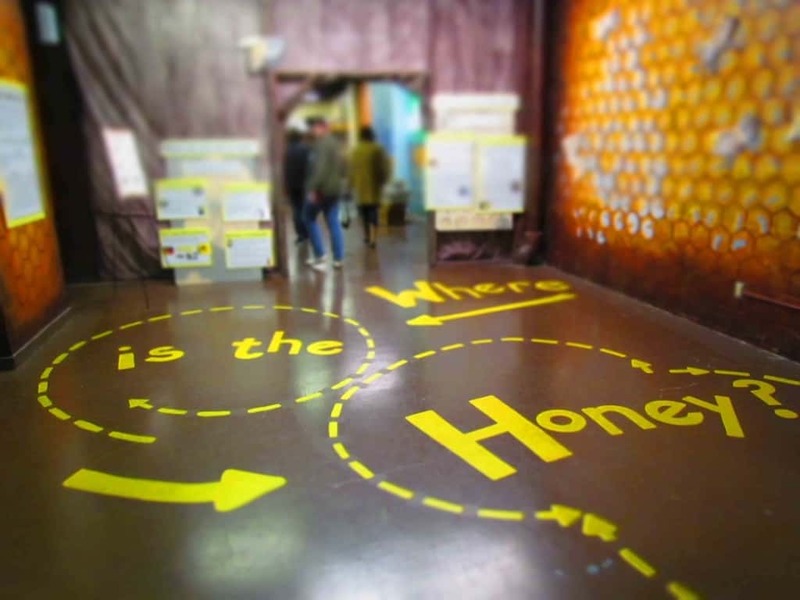 The area is decorated like the interior of a hive and has plenty of informational placards to help drive home the message. The Midwest has long been considered the breadbasket of America, so the declining population of bees should be taken seriously by us locals. Portions of this exhibit explain the steps that each of us can take to help prevent further damage to this vital species. There are even some items for kids to play dress up as a beekeeper to help parents open a dialogue with them about the importance of honey bees. After we passed the bee exhibit, we came to an area that was filled with a variety of displays. Here we found everything form telephones to old banks. The latter was quite interesting to me. I have to admit that I’ve always been fascinated by these old mechanical devices. There are a wide range of them on display, many of which I never realized even existed. Have you ever seen a Jonah and the Whale bank where they are throwing Jonah off the ship? 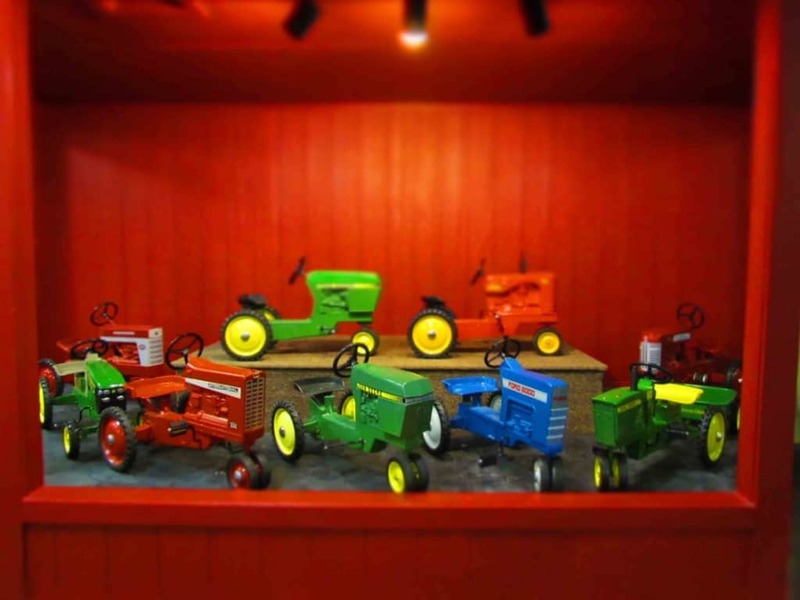 As we made the turn back into the main gallery, we found a collection of toy tractors. These shiny vehicles reminded us of our visit to the Deanna Rose Farmstead where kids can ride these around a track. We’re betting there are a lot of visitors who have to explain to their kids that these are just for looking at and not for riding. After touring the Gallery, it was time to take this show on the road. By that I mean, head outdoors to the other exhibit buildings. First we had to prepare for the cool winds, but soon we were out and about on the grounds of the Ag Hall. The first building we came to holds the Museum of Farming. Here we found over 20,000 feet of space dedicated to the farming industry. Most of the artifacts are antique farming machines and implements. 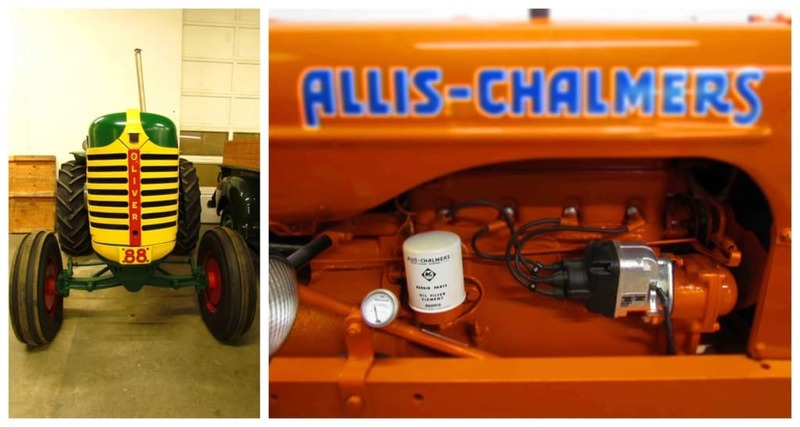 Obviously, motorized machinery hasn’t always been in use, so there are displays dedicated to the equipment used during the period of horsepower. These days we usually only see horse drawn items at special events or reenactments. For those working the farmlands it would have been an everyday occurrence. Moving out into the larger area behind the main building we took a stroll down the road toward the Farm Town exhibit. 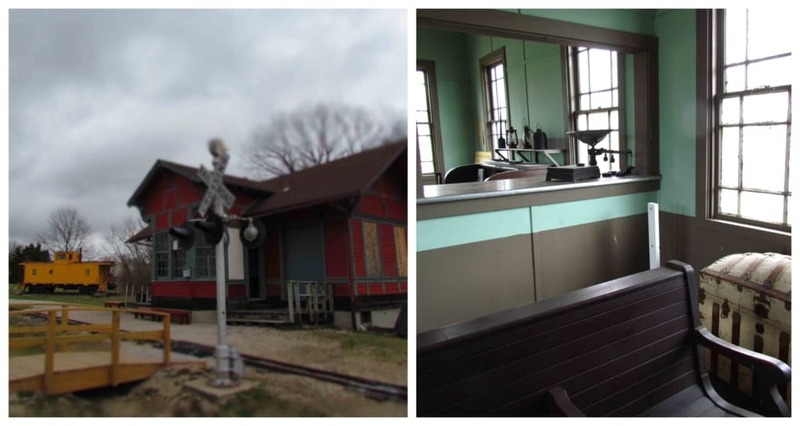 This collection of turn of the century buildings recreates life in a small plains town. Our first stop was at the Santa Fe Depot located along the narrow gauge rails. The diminutive train wasn’t running this day, but does for special events. Check their website (Use the link at the beginning of the article.) for a calendar of events. The next building was filled with anvils. At first it didn’t seem all that thrilling, but as we toured it we realized the importance of this simple tool. Life in those days would have required the assistance of a good blacksmith. This would have been an integral person to have in every community, and in most, the smithy was held in high regard. It just takes thinking about things in the right perspective. We stepped into the Island Creek Schoolhouse to escape an especially blustery breeze. Here we could imagine the classroom filled with young minds eager to learn about the world around them. Of course, some would be staring out the windows dreaming of being in the world around them. This building was filled with lots of period pieces that helped us relate to that time period. With time running short, we made our way to our final stop. 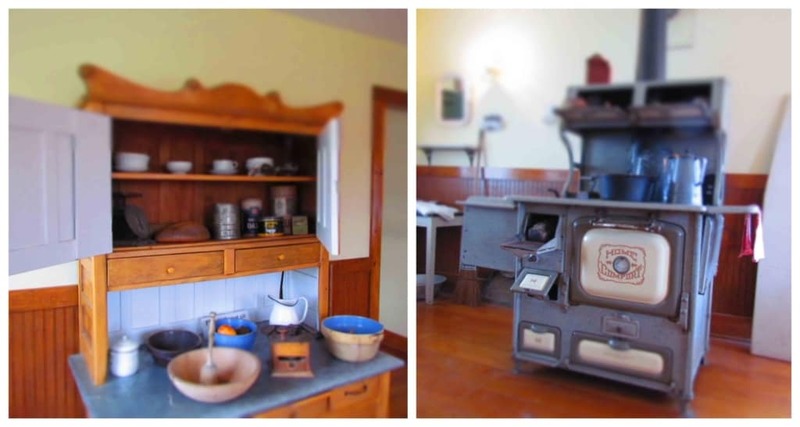 The Smith House is an authentic 1890’s farm home. It was donated by a pair of sisters and reassembled on its Ag Hall site. Inside is set up with many of the comforts that would have been readily available during the post Civil War era. The kitchen would have been a bustling center of activity where the three meals of the day were prepared. Exploring this room, we decided that the we are glad to have the modern conveniences of our kitchen. Even if the reliability of modern appliances are less than implements made in those earlier days. We moved through the house and up to the second story living quarters. Here we found the bedrooms for the adults and children. A children’s tea set was set up and we could imagine hours of pretend being enjoyed by the family’s daughters. 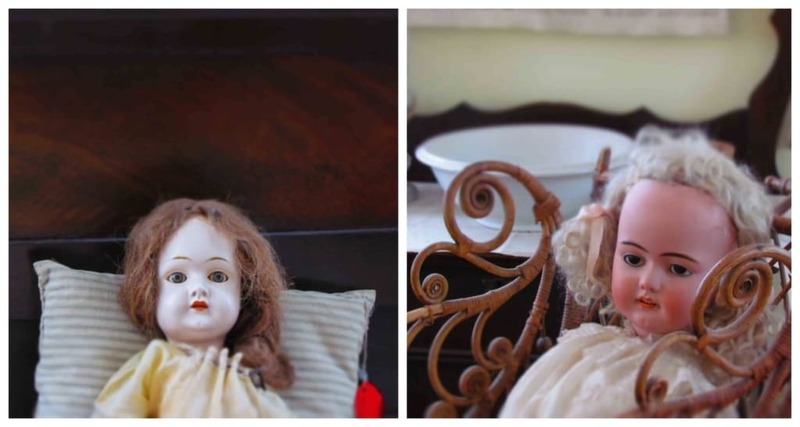 Nearby, we spotted these two dolls, that to be honest were a little creepy. It seemed like the perfect time for us to make our way back to the main building to say our goodbyes. The National Agricultural Center and Hall of Fame holds tons of history and is good for a couple of hours, at least. We are sure that during an event we would need to set aside more time, since there would be other activities to explore. It looks like we will need to check the calendar for one that we can attend. How many of you spent time on a farm? Did you see anything in our pictures that you recognized? Tell us about it! Share this place with someone who would love to visit!